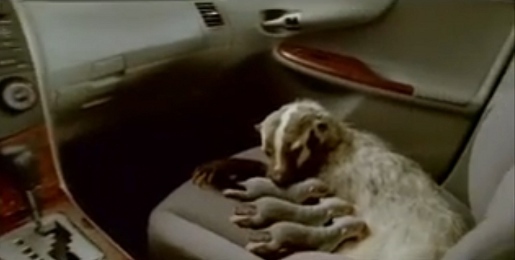 Toyota promoted the new Corolla at the Super Bowl 2008 with an ad featuring a badger and her young, a collection of cannons, and a cellphone. “The Corolla cabin is so quiet Toyota locked our friend inside with ferocious sleeping badgers. If awakened, they’ll gnaw his face off…” “Living the Dream for less coin”. The Badger spot was developed at Saatchi & Saatchi LA, Los Angeles, by executive creative director Harvey Marco, creative directors Andrew Christou and Greg Wells, art directors Peter Vattanatham and Verner Soler, copywriters Sam Bergen, Shannon Wilch and Denise Reynolds, senior producer Jennifer Pearse, director of integrated production and multimedia Damian Stevens. Filming was shot by Jesse Peretz via RSA Films, Los Angeles. Editorial work was done at Beast.